If you have RSV, that means you have the respiratory syncytial virus. This particular virus affects your respiratory system, including your lungs. While RSV is common, there are a few risk factors and complications that you should be aware of. The more knowledge you have, the better prepared you’ll be to handle an infection and to seek medical attention when necessary. The symptoms of RSV can vary in intensity, largely depending on your potential risk factors. If you or someone you care about exhibits symptoms of RSV, it’s important that you understand what you’re dealing with and what you should do next. The following questions and answers can help prepare you to deal with the respiratory syncytial virus. The answer to this question depends partly on your age. Most people with RSV will have symptoms of the common cold, including sinus problems, sore throat and cough, a headache, and possibly a mild fever. However, RSV can cause more serious symptoms. These include trouble breathing, wheezing, a fever, and a persistent, possibly violent cough. If you’re having trouble getting enough oxygen, your skin could take on a bluish color, as well. Who’s at risk for developing the more serious symptoms of RSV? While serious symptoms can develop in anyone, there are certain populations that are more susceptible. The main at-risk group is babies. This includes young babies and those who are born premature. Babies with RSV may seem apathetic, have rapid breathing, cough, and eat very little. The second at-risk group is any person who suffers from lung or heart problems, including infants, children, and adults. When should you get medical attention for RSV? If the symptoms of RSV are bothersome or you’re not sure if RSV is what you have, a medical professional can give you a proper diagnosis and help manage your symptoms to make you more comfortable while you heal. If you experience any of the serious symptoms of RSV, see a medical professional right away, especially if you’re having trouble breathing, have a high fever, or develop a bluish color on your skin. Watch the lips and nailbeds carefully for a change in natural color. When you’re not feeling well, the last thing you want to do is wait for hours in an emergency room or wait days or weeks to see your regular health care provider. 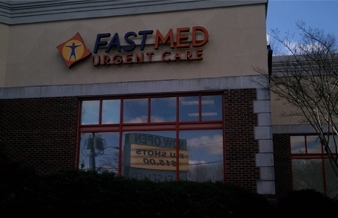 Instead, come by your neighborhood FastMed Urgent Care clinic. We’ll get you in and out as fast as possible, so you’ll be back home in bed before you know it. Get quality, affordable care with FastMed.